Something that bugs me, that I am hearing much too often, is how “Generation Y” (just now coming en masse into the workplace) knows so much more about computers than “we” do (“we” apparently referring to anyone over, say, 40), usually parroted by somebody who actually doesn’t know all that much about computers. I even heard a lecturer at a workshop in a room filled with several hundred successful business managers say, “They even know more than every one of you in this room combined.” Wow, what a big slap in the face, and shocking in its actual inaccuracy. These aren’t Generation Y people saying this, though (of course, they may be thinking it), but fading out Baby Boomers, or people advising fading out Baby Boomers (either hoping to facilitate that fading out, or else attempting to help them forestall it). Usually they back up that contention by saying that there wasn’t ever a moment in the lives of Generation Y when there weren’t computers around; “They grew up with them”, and also (which I think is so funny) the fact that Generation Y text messages so much. “E-mails are passé,” said our school’s board chair, who, himself, probably just recently got into e-mailing, so must watch his kids with jaw-dropping amazement as they dance across their Blackberries with their thumbs. Well, sure…I think there must be a point in everyone’s life in a rapidly technological-developing world where individuals choose to stop and get off. There actually are several of my close friends who drew the line at getting a personal computer at all. As far as they were concerned, they could balance their checkbooks on the back of the bank statement, and they could sort their recipes in card files—checkbook balancing and recipe organizing were usually the arguments for getting a home computer back in the 80s when that technology exploded out onto the scene. Oh, that and games, which I know for a couple of decades was the main reason families bought computers for the home. One friend of mine lost his career due to the advancement of computers into the workplace; he never could even learn how to master a mouse, unable to still his tendency to pick it up in the air and click it at the monitor as if it were a television remote control. Another friend, a sales representative, was forced to receive instructions from her vendors and her sales organization via e-mail and finally allowed into the house something I have never seen, “an e-mail server”, which is, apparently, a device for sending and receiving e-mail ONLY, and I have been instructed to NEVER e-mail her, its use is ONLY for business purposes, an instruction I’ve been able to follow due to the fact that she has refused to give me her e-mail address. I, myself, drew the line at the above-mentioned text messaging. Just as I am still aghast at how many Generation Yers I see out in the world who are always, constantly, and forevermore talking on a cell phone wherever they are and whatever they are doing, I, generationally or personally, do NOT have the psychological need to be “connected” every single second of my day. An extrovert like me, who can make strangers on an elevator laugh with a sly comment or two, seems like a true introvert when compared to those constant cell phone users whom I feel are downright co-dependent. And ramp that one up a notch by the need to remain symbiotic via text messaging in class or during business meetings. Unbelievable. I do not view “want 2 c u after work” as a sign of superiority that should make me quake and worry about my future employability. There was also music testing for record industry R&D, but instead of using the conscious dial method of input, members of the audience were hooked up to galvanic skin monitors and their unconscious reactions were recorded that way. The computer could receive and compute the data by any parameters the analysts wanted, characterizing individuals in the audience by gender, age, education, income, various tastes and purchasing habits, and so on. A guy who was my roommate at the time worked as an assistant for that engineer who developed those systems and that engineer was also the “technological genius” working as a consultant for the fledgling Apple computer company, and others like it, so my roommate would bring home exciting tales of these small, DESKTOP computers that were being developed right in front of his eyes, and mine, too, as he often got permission to bring a prototype Apple or a Commodore, or some other mini computer, home for us to play with. The engineer wanted to see what we would do with them. I programmed the Commodore to write Dada poetry. [Interestingly, the dada artist Man Ray had lived in that very apartment, so maybe I was feeling some of his influence!] Remember, this was before most people even knew there was such an idea as personal computers, whereas my roommate and I were writing programs on personal computer prototypes sitting on my dining room table. The famous Hollywood writer’s strike around 1978, 1979, occurred then (since, then, last year or so, we’ve had another one) and that stopped all scripts and other written production, so we all were laid off from that research company. Needing to find some other employment, I had been hearing about the new concept of word processing, and I jumped into that with both feet. I was hired by the Los Angeles (entertainment industry) branch of the sixth largest law firm in the United States as a word processor, in those days a relatively high-paying field, because it was so new and specialized. Again, this wasn’t clicking on an icon or selecting functions from a menu…we didn’t even have CRT monitors, then. You’d learn word processing star codes (these varied depending upon which company’s system you were using, but a typical example might be “*LM” and a number to set the left margin on a document, “*RM” and another number to set the right margin) which you would enter into the computer via an inputting keyboard that was like a typewriter in that it also typed out on long attached sheets of paper everything you had entered in. The typewriter was also an output device that printed out selected samples of the document you were preparing, and then, once your document was finished, completed copies for circulation, editing, and possible revision. Many years after that, I was hired by the surgical department of the Stanford University Medical Center to be their resident “computer genius” (as some of the staff called me). Desktop computers were now entering the market and the business manager bought several of them for his administrative offices, but nobody knew yet what to do with them. He had the dream of having all the administrative functions programmed and he hired me to figure out what we could do with those computers and to use them to bring into fruition his ideas. I really cut my teeth on those PCs back then and I made them do things that IBM hadn’t even imagined they could do. The software for those computers were still tabulas rasa, blank canvases available for the individual imagination to put into use. By then we had CRT monitors (black and white, of course) and used floppy discs instead of solid disc packs; these floppy disks were about the size of 45 rpm records and you needed to load into your computer at least two of them, one for the software and the other for the data. One of my favorite accomplishments during that era was creating and executing the idea of what I called “The Automatic Audiology Examination Report Generator.” The ENT (ear, nose, and throat) department was having trouble getting all their hearing exam reports prepared; they were overflowing with completed tests and were getting further behind in getting the reports typed up (word processed). I realized that most of what they reported was standard, with some individual variations, so I created a system in which all the clerk had to do was enter X’s on a database grid that corresponded to whatever standardized tests had been taken and the test results, and then enter in where appropriate specific data that was unique to that individual (such as name, address, unusual test results, and certain “ad hoc” comments), then merge that individual database with a shell document that automatically printed out the complete verbiage of the audiology report: “Now presents Susan Smith complaining of chronic tintinitus of the left ear; examination reveals a profound hearing loss in the 8,000 to 9,000 frequency range…” etc. Instead of fifteen or twenty minutes per report, the clerk could do each one in about three to five minutes; she put the X’s in the particular places and the COMPUTER wrote the report. It was a hit. Again, just recently, all the companies across the U.S. that have 403(b) retirement funds [that’s the non-profit version of a 401(k)] were being made by the IRS to have new plan documents prepared that reflect the various changes in the law that had been made recently. It’s a huge extra load of work for human resource and business managers everywhere; fortunately in our case, TIAA-CREF, our retirement fund, would have plan documents made for us if we presented to them all the features of our particular plan. This was done via a series of questionnaires that reported all the features, essentially check boxes and filled-in blanks, and then a report-preparing company would turn that information into the verbiage of a written plan. Once I saw the completed process, I realized that this was EXACTLY the same concept as my “Automatic Audiology Examination Report Generator”. The company was able to prepare plan documents in virtually no time at all, because the system of box checks and numbers or words filling in blanks led to the automatic selection of appropriate sentences or paragraphs, equivalent to the system I created for Stanford’s ENT department. Again, not only something that I witnessed, but something that I actually developed myself (whether others unknown to me also developed something similar, or not, I do not know, but with Stanford University being the nucleus of Silicon Valley, I’m just sayin’…) is still being productively used today. Despite there being stability, there is also change, and so my boss and benefactor, the business manager, got a higher job at a different university, in Florida, and took with him his administrative vision, which his replacement at Stanford did not share, or even understand. At his new job, he was high up enough that he answered only to the Board, and he invited me to go with him to Florida to run that university’s entire IT department. Damn…one of those cross-roads in life in which I probably took the WRONG turn. I turned this opportunity down, thinking that IT management was not really the career I wanted for myself. How different my life would be now, though…. Instead, I had a business idea of my own I wanted to run, so I left Stanford and attempted self-employment. 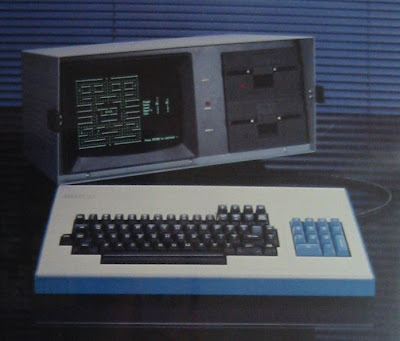 I needed a computer, but PCs, even the most rudimentary ones, were way too expensive for me at the time, so I rented one, a Kaypro. Does anybody remember those? The Kaypro was “portable”; it was a metal box, like a small suitcase, with a handle on the top lid for carrying around. You snapped the lid off and inside it was the keyboard; the rest of the box was the computer itself, with slots for the required two floppy discs and a CRT monitor about five inches in diagonal. Even though it looked like somebody’s Heathkit oscilloscope, I loved the thing. I actually did have a few customers for my business and I believe I created some marvelous things for them. But the money coming in was far too little and too slow. What all happened then is not relative to this particular tale, but basically the business did not work out; whether the idea was good or not, I can’t quite say, but the timing was definitely wrong. I saw no solution other than to go back to work for somebody else. I ended up working for Seagate Technology, maker of hard drives. My job was mostly word processing, using the exact same type of computers I had used at Stanford, but in a more mundane, less creative way (using the word processing function, but not the database and programming functions). One interesting part of the job, however, was talking to the company’s engineers from India and translating their verbal instructions for assembly and testing of hard drives into understandable English for the factory. So, for all practical purposes, I was now “writing hard drive assembly instructions”. When I next actually bought (instead of rented) my own computer, I made sure that it had the latest technology, a hard drive by Seagate. In 1986, I finally bought my first home computer. I was going through some old files yesterday and came across the sales contract for it, which was a Hewlett-Packard Vectra PC, with an IBM COLOR monitor (latest technology) and a Canon LASER printer (brand new printing technology). That whole system cost me in the neighborhood of $10,000. Why, just to have a second font on the Canon laser printer cost me $250 for an additional font cartridge. Not many today would pay $10,000 for home a computer system, yet this was in 1986, when $10,000 had the present-day buying-power of a little under $20,000. So, by today’s standards, I was willing to pay $20,000 for a home computer? Yeah, maybe not very many people of my generation did that; that having a PC at home was not as usual or expected as I might have thought. But with that HP in 1986, I was also on-line with a dial-up modem. This wasn’t the “Wild World Web”, I don’t think that term was in use at the time. It was CompuServ and now I was shopping on line, buying airline tickets on line, and conversing with people on bulletin boards. E-mail, as such, wasn’t quite so common, since so few of the people I knew even had computers. But otherwise, I was conversing all over the world with those who DID have computers and were likewise on CompuServ. Naturally, I continued to evolve from there until today I have an Apple laptop and a gorgeous biggest-screen-possible aluminum iMac desktop, and an HP color all-in-one printer/copier/scanner/fax, all DSL networked wirelessly. I can take my lapdown down to the pool and do work and go on-line, or, of course, go on-line anywhere in the world where there is free wireless Internet connection. No, I do not have an iPhone with dozens of apps, although my T-Mobile cell phone does have a (cumbersome) Internet connection of sorts that I use mostly to check out movie times when I am out and about. So far, I still draw the line at text messaging, as a technology I don’t want or need. When I first started working where I work now, Y2K was the big feared danger (and I had to be on a committee that had a plan regarding what we were going to do about it). I’m not going to say that it WASN’T a danger, although all the computer-controlled systems did not shut down and our society did not collapse on midnight of January 1, 2000. What I will say was that any danger there was, was fixed by…whom? By people who KNEW all the old computer systems, the Fortran and the COBOL and so on, all the old programming languages that I and fellow students in college in the late 60s were learning, that’s what’s UNDERNEATH all the beautiful, convenient, accessible user interface that everybody enjoys these days. What if those people weren’t around to go back into the Gordian Knot of those complicated systems to uncover and reprogram all the dating code? The point is that while we see rapid change happening on the outside of technology, and the ever-expansion of its amazing use, deep down inside are the footprints, the vision, the blood sweat and tears, the wisdom, and the heart and soul, of OLD GUYS (men and women). “Old guys” who were there and contributed to it, or just old guys who just “were there” and understand it. Sure, some high school kid can (and does) “text message”, just as he will utilize whatever comes next, and whatever comes next after that, and then whatever comes next after that. And my little 11-year-old nephew never seems to be without his laptop. But don’t, I repeat don’t, ever say that the new user “knows more” than the previous generation or two just because they “have” the technology and they frequently use it in its latest form…in fact, can’t imagine being without it. Those previous generations are the developers and observers and the users from way way back who are INSIDE the very technology that the latest users are enjoying. Let’s remember that, and have some respect. Even Newton in his science was not willing to accept a singular glory, despite all his genius, saying, as he did, that he knew he was what he was due to his standing on some very broad shoulders. We should all be at least as humble as Newton was.